Discussion in 'HermitCrabs"R"Us Exclusive Contest - "A Boardwalk ' started by Mckenny, Sep 3, 2011. The POLL is now here to vote for your FAVORITE PHOTO. 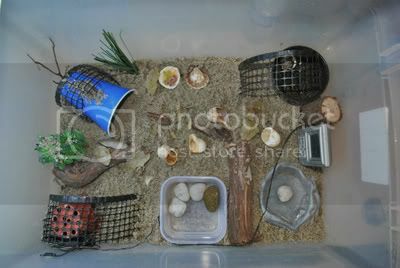 Whether you have an aquarium set-up or something else, all are welcome to enter whatever it is you use for a Crabitat. >NO PHOTOSHOP or other "enhancing" software. >Just regular photo's of your crabitat...no Photobucket, etc. >NO disrespect please...some will have more elaborate tanks, and some will not. The main thing is the Hermies are happy and safe and enjoying life. So please everyone, all are more than welcome to submit your picture for the contest!! A Poll will be set up for voting and the winner will receive a small prize for their Hermies. You'll have until September 20th at midnight to submit your photo. So get some fresh batteries and show us "whatcha" got!! my first photo contest , My crabitat isn't much, the coconut shell and stick i made myself lol. I tried to make the picture larger and that didn't work either. I can't figure out a way to get a whole 55 gal tank in one shot from the top, camera doesn't have panerama view, so this is as good as is gets.. I can describe what's in there. in one corner there is the magnet shelf with 2 ways to get up & down, a palm tree looking stump and a dead tree looking thing next to it, by those tucked away are cholla wood with huge fake plants hiding them. in the middle is grape vine leading up to a huge corner caddy with a corner food bowl that has acorn caps, cuttle bone, bark, leaves and goodies in it & I stuck leaves down in between the shower caddy & the glass for more camo, on the floor by that is the huge cave they never use, and by it is their water bowls and around the tank are various random fake plants stuck in places. So... What does happen if it end out being a tie still at midnight? So because it has ended automatically, it is now official---you and Scoobdoo will share the first place prize. So if the prize is a 6 inch piece of choya wood, you both now get a 3 inch piece. :hilarious: :sarcastic: IT'S A JOKE---I'M KIDDING!! !